Normally, a book review would begin with a summary of the plot. But I can't offer you that for We Were Liars, because each reader will come to understand this book at different times in its narrative. I must be careful. Here's what I can tell you. We Were Liars is about three highly privileged wealthy teenagers and their one less wealthy (and less Aryan) friend. Every Summer they holiday, with their parents and younger siblings on a private island owned by their Grandfather. The four friends are The Liars. They are not likable people and their families are occasionally revolting. But we have some sympathy for our narrator Cadence, who suffers from crippling headaches. She had an accident at the island in the Summer before her fifteenth birthday, but she doesn't remember anything about it and her memory of that whole Summer is fragile. We Were Liars contains some of the most heart crushingly beautiful prose I've ever read in a Young Adult novel. Some lines are poetic and float free of the standard constraints of the page. Other parts are told as short fairy tales. Sometimes there is circling repetition. Sometimes it reads like a teenager's diary. Incredibly, it all comes together perfectly. I was continually astonished by the technical genius of E Lockhart's writing. This is a book I would recommend to anyone over the age of 15 and I do mean teens and adults alike. 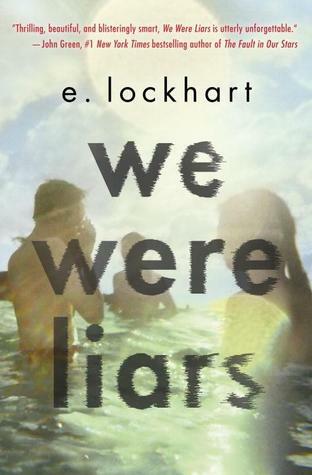 We Were Liars is a sophisticated novel that deserves to find its audience.